You can also read my Focused Interview with Steven Pressfield or my review of Do The Work by Steven Pressfield. Let's start by saying that this review won't be good enough. A lot of people will read it, but not everyone will buy the book, and this will be my fault, because everyone should read this book. Well, probably not everyone. Only if you are a writer (or aspiring writer), work from home, work on research or have a very flexible schedule/deadlines. I apply to a handful of these categories, and thus I think this book is definitely awesome. 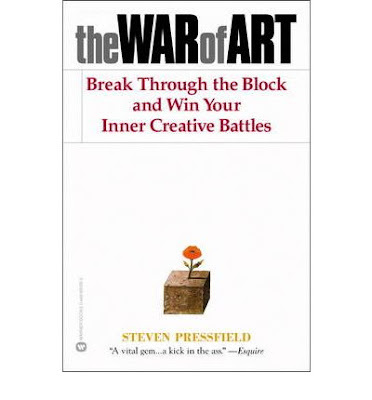 I had known about Pressfield's The War of Art: Break Through the Blocks and Win Your Inner Creative Battles since a long time ago. Very recommended everywhere... The problem is that I had read his book Gates of Fire, and I didn't like it too much. Thus I didn't consider reading it, but recently I read about it again and decided to give up and read it. Oh boy, if I had done it earlier! The War of Art is about naming your enemy, Resistance. Resistance is this force that keeps you from writing, working, reading, improving. A force that it is always present, the always watching enemy. And Pressfield knows very well this enemy: he says he was defeated by it from age 24 to 32. What happened when he was 32? He discovered the enemy within and kept it under control. But resistance is more than an enemy. Resistance is your inner compass. The more resistance you feel towards a project, the more important it is. We can use it, like riding a wild horse we have to be wary of who is deciding the route. Because this horse will be tame like a pony until you see the finish line, when he will act like a raging bull. But again, what else happened when Pressfield turned 32? A revelation: This very moment, we can change our lives. We can turn the tables on resistance. Now. We can sit down and do our work. There are a lot of ideas to take from this book, but I can't rip it off or you would not buy it and Pressfield would not be happy. All in all, this book is just perfect. I just can't recommend it enough. The Book Depository: You can only buy books here... But the prices are really competitive, and has free international shipping. I've bought my last 5 books from here, as you don't need to think about shipping rates buying is just going there and buying one book. No need to plan those 5-10 books boxes to spread the fees.